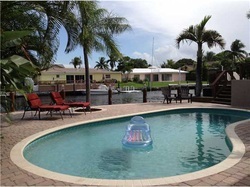 The cove vacation property is lovcated in Deerfield Beach. This updated property is in pristine condition overlooking the Intracoastal Waterway only minutes to one of the more popular beach towns Deerfield beach. Wifi throughout, new flat screens it is only minutes to local restaurants and nightlife. This is a perfect beach house especially for families and adults offering easy access to downtown Fort Lauderdale and quick access to Boca Raton. Publix grocery store, CVS drugstore and several other convenience stores are nearby. At VacationRentalGizmo we suggest stopping at Charm City burger famous for winning the Boca Burger battle in 2010, or a quick ride to the Whale's Rib featured by Guy Fiery in Diners, dives and Drive Inns. JB's on the beach offers an excellent menu and live music regularly and don't forget Two Geogre's (aka The Cove). This popular location rests nicely on the Intracoastal and is a favorite with locals and travelers alike. Sit back and watch some of the boats pass and dock for a lively evening. Events are regular, in downtown Deerfield and surrounding areas, ask VacationRentalGizmo for any suggestions!! !